Researchers nearing a blood test for Alzheimer’s disease. In Alzheimer’s, the brain begins to change years before symptoms emerge. Detecting Alzheimer’s antibodies at the preclinical stage would give patients an opportunity to work with their physician to make lifestyle changes or receive available treatments before they become symptomatic. Potentially, this early intervention could help those with preclinical Alzheimer’s avoid or delay the most devastating symptoms. This disease affects an estimated 5.3 million Americans and is among the top 10 causes of death in America, however, at present there is no FDA-approved blood test for Alzheimer’s. Now, researchers from Rowan University School state they are nearing development of a blood test which can accurately detect the presence of Alzheimer’s disease, which would give physicians an opportunity to intervene at the earliest, most treatable stage. The team state that people found to have preclinical disease can take steps to improve their vascular health, including watching their diet, exercising and managing any weight and blood pressure issues to help stave off or slow Alzheimer’s disease progression. The lab presented their findings at the event OMED 15. Previous studies show that while the cause of Alzheimer’s remains elusive, it is clear that maintaining a healthy blood-brain barrier is a critical preventative measure. Diabetes, high cholesterol, high blood pressure, stroke and being overweight jeopardize vascular health, and have all been linked to the disease. As blood vessels in the brain weaken or become brittle with age, they begin to leak, which allows plasma components including brain-reactive autoantibodies into the brain. There, the autoantibodies can bind to neurons and accelerate the accumulation of beta amyloid deposits, a hallmark of Alzheimer’s pathology. The current study focused on utilizing autoantibodies as blood-based biomarkers to accurately detect the presence of myriad diseases and pinpoint the stage to which a disease has progressed. The researchers state that there are significant benefits to early disease detection because researchers now know that many of the same conditions that lead to vascular disease are also significant risk factors for Alzheimer’s. The group explain that all humans possess thousands of autoantibodies in their blood and that these autoantibodies specifically bind to blood-borne cellular debris generated by organs and tissues all over the body. They go on to add that it is well-known that an individual’s autoantibody profile is strongly influenced by age, gender and the presence of specific diseases or injuries. Results show that the blood test has also been successful in detecting other diseases, including Parkinsons’s, multiple sclerosis and breast cancer. The lab conclude that diseases cause characteristic changes in autoantibody profiles that, when detected, can serve as biomarkers that reveal the presence of the disease. The team surmise that a healthy lifestyle is the best medicine for preventing disease and many people tune out messages about nutrition and exercise until a health crisis gets their attention. They go on to add that they can’t think of a single patient who wouldn’t take steps to prevent the progression of Alzheimer’s if they could directly affect their prognosis. For the future, the researchers hope that by detecting Alzheimer’s disease long before symptoms emerge those with disease-related autoantibody biomarkers will be encouraged to make beneficial lifestyle changes that may help to slow development of the disease. 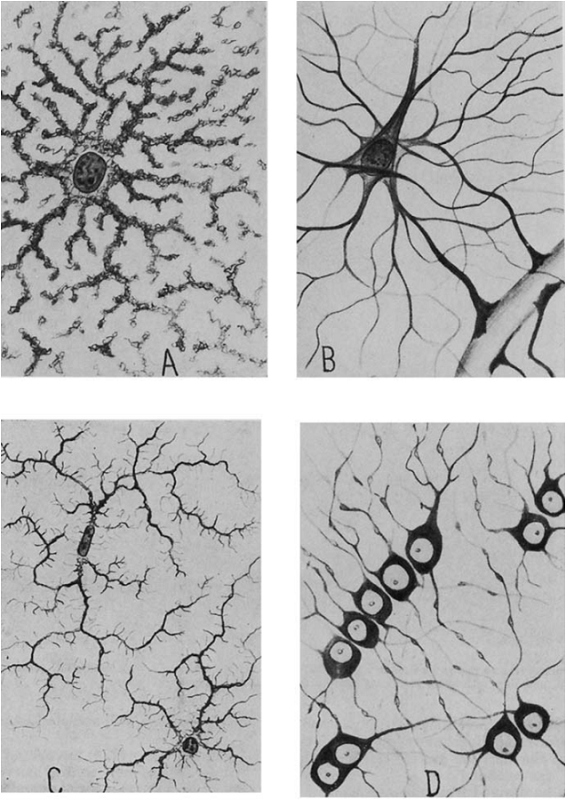 Del Rio-Hortega’s four types of glia. A: Gray matter protoplasmic neuroglia. B: White matter fibrous neuroglia. C: Microglia. D: White matter interfascicular glia (oligodendrocytes) (Somjen 1988, Fig. 4).